The Egg Throw is a move used by Yoshis. This is Yoshis' signature move and was first used in Super Mario World 2: Yoshi's Island. To use it, a Yoshi must first get a Yoshi Egg. 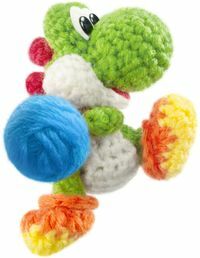 Each throw uses one Yoshi Egg. The player must hold or press the aiming button to show an X-shaped cursor. It keeps going in the direction in which it is thrown until it hits a wall, ceiling, or the ground, at which time it bounces. When it hits an enemy or bounces too many times, the egg will break. When it hits a wall, ceiling, or ground it bounces, especially useful in underground stages. If it bounces multiple times, it will change color, going from green to yellow to red, after which it will break. Most bosses in the Yoshi series are defeated with this move. In Super Mario 64 DS, Yoshi doesn't have to aim because it automatically targets the nearest enemy. If no enemies are around, it is thrown directly forward. It can also chain to a couple of enemies. If it does this, not only will Yoshi have cleared the path more, but he will get 2 Coins per enemy, rather than just 1. The move is useful in the mission Behind Chain-Chomp's Gate because it can paralyze the Chain Chomp for a few seconds. However, he can only carry one at a time, instead of six in the Yoshi series. In the Super Smash Bros. series, Egg Throw is Yoshi's up special move. When used, Yoshi throws an egg at an upward arc rather than directly forward; the angle of the throw can be adjusted by tilting the control stick after executing the move, and the distance depends on how long the player holds down the special move button. Yoshi is also given some height when using the move in the air, but it decreases each time he uses it. The eggs break as soon as they hit an opponent or object; in Super Smash Bros. Ultimate, however, the eggs can bounce off the ground at least once before breaking. In Super Smash Bros. for Nintendo 3DS and Super Smash Bros. for Wii U, this move has two custom variants: High Jump and Timed Egg Throw. High Jump gives Yoshi an extra jump but does not throw an egg, and the move can still be used more than once but each jump gives less height, while Timed Egg Throw throws an egg that goes through enemies and explodes after a set amount of time. ↑ 05: Yoshi – Super Smash Bros. Ultimate. YouTube. Retrieved July 4, 2018. This page was last edited on January 6, 2019, at 17:16.